After a blissful, sunny afternoon of rollerblading up and down the South Bay (or as I call it, Red Hermando -- for Redondo, Hermosa, Manhattan & El Segundo beaches,) I decided I might as well dine in the neighborhood too. 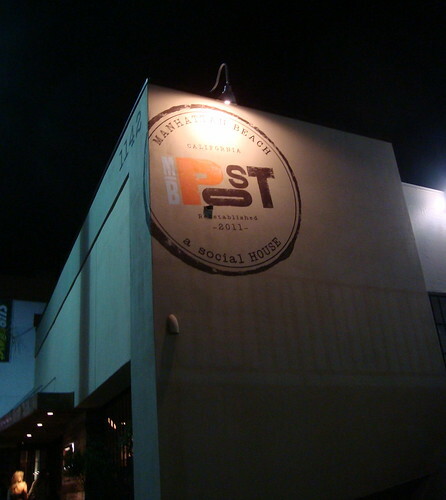 I have heard some good buzz about the newly-opened MB Post, and had a good impression of David LeFevre's cooking from his previous post @ Water Grill in downtown LA, so I met up with Caroline on Crack to get some impromptu bites & sips. Since it was Saturday evening and located in downtown Manhattan Beach, I wasn't surprised at how jam-packed the space was. What was a bit more shocking is that there was absolutely no waitlist for walk-ins that night, so our only option if we want to eat without a reservation is at the bar that seats about 15, which of course was packed as well (and already surrounded by other barstool buzzards.) We were slightly peeved, especially since some tables stayed vacant for about half an hour, but decided to go for a round of drinks at least... while keeping a sharp eye out for anyone wrapping up at the bar. Our first cocktails did LOTS to alleviate our vulturing angst. 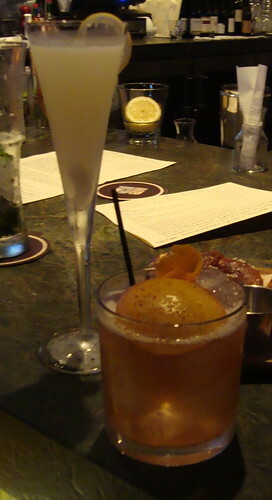 My Southern Hospitality (front), a bourbon punch with grilled peach, cinnamon and vanilla, was superb. Sweet-smelling without actually tasting sugary, and the fruit + spices were wonderfully balanced against the Eagle Rare. Plus, it was super quaffable! 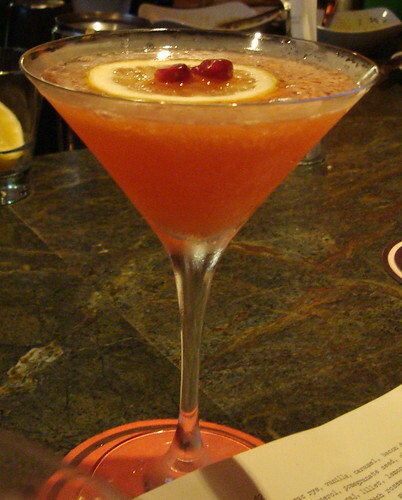 While we would sip on many more tasty cocktails throughout this meal, this is surely my fave of the list. Meanwhile, Caroline on Crack got the equally refreshing & downable Dirge: Corpse Reviver. Both were great for a still-warm summer evening, maybe not-so-great considering our empty stomachs (and me not having eaten for at least six hours.) And indeed, they packed an unexpectedly early wallop. Just when we finished our first drinks two seats opened up @ the bar, so we swooped in and snagged them. After going through the whole menu (that I'm giving extra kudos for being updated daily plus spontaneously-looking last-minute scribbles!) we decided on sharing three entrees... and another round of drinks. 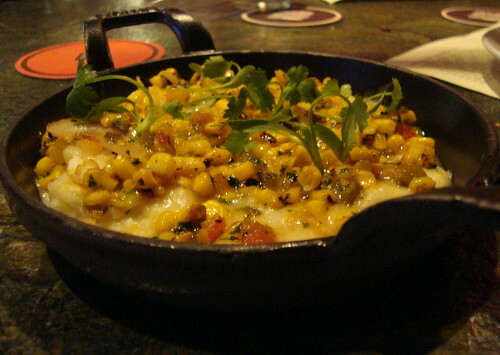 Number two was what I dubbed "Corn & Grits": grilled corn kernels on top of Anson Mills' antebellum white corn grits with fontina cheese and chili. Total comfort dish -- hot, hearty and cheesy, with the occasional welcoming pop of heat & sweetness from the chili and kernels. And somehow, this dish didn't feel super-heavy, which I appreciated since we still have a few more items to eat. Our entree was local white sea bass (I believe it was from Santa Barbara area), with a 'summer vinaigrette', kalamata olives, basil and squash slices. 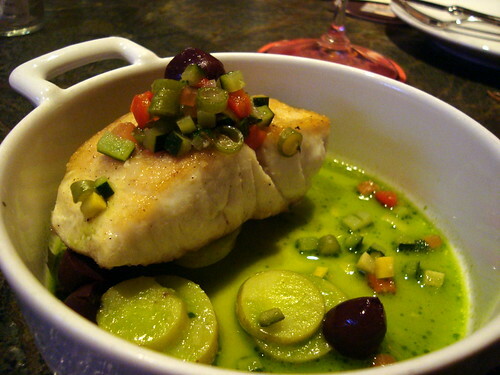 It was well-prepared: the fish was firm and meaty without being overcooked, and the vinaigrette was well-seasoned and struck a nice balance between oil & acid, but it felt a bit lackluster compared to the first two things we had--maybe because it was a more straightforward dish. Nonetheless, even after the fish & veggies were gone we used our bread to lap up the remaining sauce. 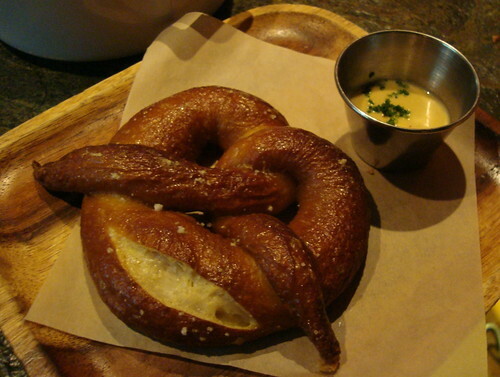 Still slightly less-than-full, and in need of something to soak up the alchy, we added an order of their fleur de sel pretzel with David's nuclear horseradish mustard. It hit the spot as a bar food, with a salty, crispy exterior and spongy dough within, with a dip that adds a distinctive bite that's, thankfully, less spicy than the name suggests. 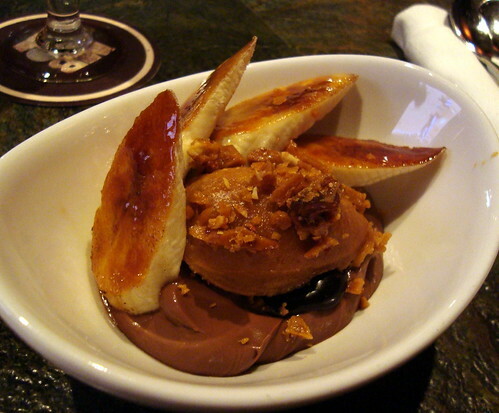 Rounding off our meal, at the suggestion of our bartend and ChowBalla (who was dining there that night,) we got the "Elvis" -- a decadent combo of peanut butter mousse, chocolate pudding, caramelized bananas and bacon brittle. Everything tasted great on its own, but when combined it turned into a little spoonful for heaven. Maybe even a little more for me, since Caroline was pescatariany, thus giving me free reign over all the bacony brittle goodness. The "Mo-Pho-Jito", with a Southeast Asian twist on the traditional mojito, with Starr African Rum, ginger, coriander honey topped with zests of kaffir lime. 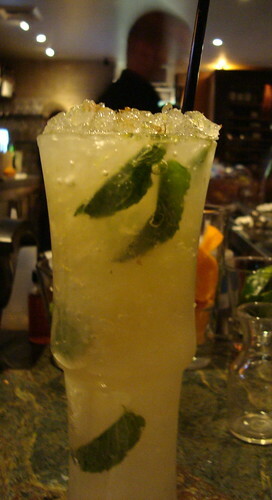 I am already a fan of well-made mojitos (a.k.a. any that's not over-the-top with excessively-smashed mint leaves,) but this one definitely takes it to a whole new level. While there's only a smidgen of ginger's spiciness & the coriander seemed absent altogether, those freshly-grated zests hit the spot! "Virgil's Ascent", a Negroni variation with cloves and pomegranate seeds - a great summer take on a drink that's traditionally bolder and heftier. It still has the classic's bouquet of floral & herbal aromas, but the fruit and cloves gave it a delightfully spritzier feel that makes it an easy warm-weather sipper. The Belgian-influenced beer list is worth a look too - we wound up splitting a Buffalo Belgian Stout from Brouwerij Van den Bossche, which turned out to be great on its own or with sweets. It definitely has the characteristic chocolatey-coffee notes from the dark-roasted malts, but is considerably lighter in body than most stouts and a tinge of fruity-yeasty notes that made for a complex & provocative brew worthy of sniffing & sipping. Repeatedly. 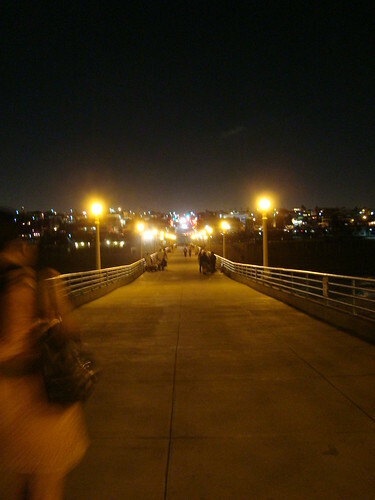 And after all that eating and drink, we decided it would be wise to take a sobering stroll, around downtown Manhattan Beach and the pier -- and played around with the night-shot settings on our cameras. Which made for an absolutely blissful day (and night) in the South Bay. Though of course next time I'll try to make a reservation or go at a less busy time of the week. 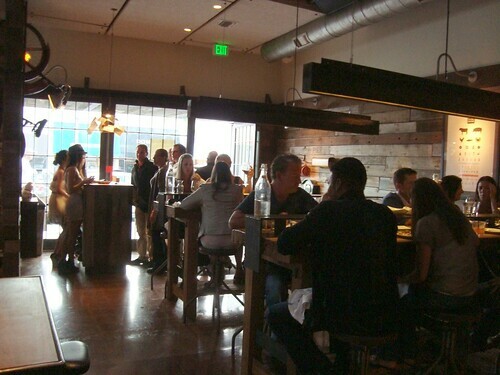 - Thirsty in LA said South Bay residents "can now stay local to enjoy reasonably-priced, sophisticated cuisine and craft cocktails in a sleek and comfortable space." - Gastronomy said "thirty-some-odd miles is quite a distance to travel for dinner, but the trip was more than worth my while." 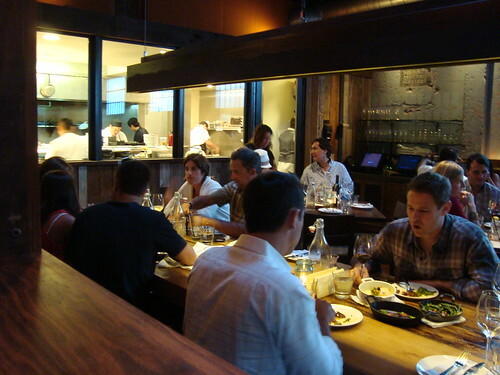 - Brad A. Johnson, while not hot on its desserts or communal table seating, summed it up as "a fantastic new gastropub [and] one of the toughest reservations in all of L.A."
- KevinEats deemed it a "great addition to the neighborhood [with] an eclectic blend of the familiar and the new." - ShopEatSleep (posting for LAist too) said "if you're looking for a casual meal made with high-quality ingredients and expert cooking, then head over . . . we would go back in a heartbeat." 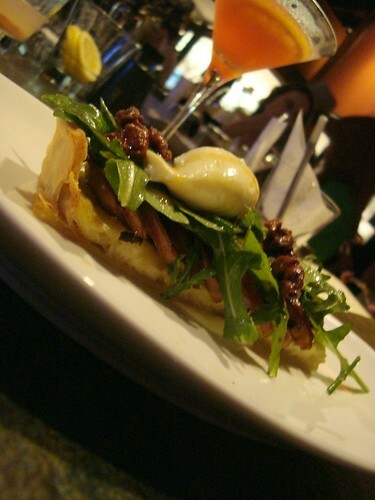 - DarinDines said this restaurant "prepared plates with familiar, yet engaging flavors . . . I could see why this place was so popular." - Deep End Dining slyly noted that "neither rain, nor snow, nor sleet, nor hail shall keep the MB Postmen (and women) from their appointed rounds." That was fun! Thanks for suggesting it. Wish I had a DD so I could have tried the beer list, too! Or is that too greedy? Sounds like you two had a lot of fun, shows through the writing. Glad you didn't give up on the place considering the crowd. Still need to MB Post. Loved MB Post! Will have to try 'the Elvis' next time! @Caroline, ha -- but I always think that whatever we didn't get to this time leaves something to look forward to next time! @TreasureLA, be sure to make a rezzie or go during funky hours. @LetMeEatCake, I actually found South Bay to be a hidden coastal gem of LA. 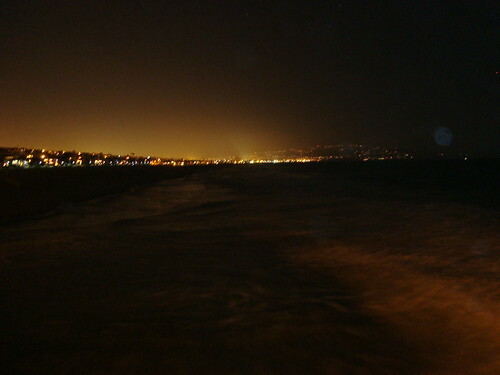 Nowhere as touristy or sceney as SaMo/Venice/Malibu. And *ahem* lots of hotties playing beach volleyball too @ MB. @Darin, the Elvis is worth every last calorie! I don't care if it makes me look like the late-career Elvis. It's THAT good.